The ultimate combination, chocolate and peanut butter, in a smoothie! I almost named this Reese’s Peanut Butter Cup smoothie, but that doesn’t sound too healthy. In order to keep smoothie making fun and exciting I often try to recreate the taste of a dessert or treat. For example, my Mint Chocolate Chip smoothie tastes pretty similar to my favorite ice cream. One of my favorite treats growing up were Reese’s peanut butter cups, which is the inspiration for this smoothie. Taking otherwise unhealthy foods and creating their healthy counterpart is what it’s all about. The healthy version usually tastes better after a few samplings because it’s not loaded with chemical flavoring agents and other crapola! This smoothie is pretty easy to make, and definitely tastes more chocolatey if you use a good chocolate protein powder. If not, a little cacao will still do the trick. I like to make this after a workout when I need protein, or as a hardy breakfast when I know I’ll be skipping or eating a late lunch. 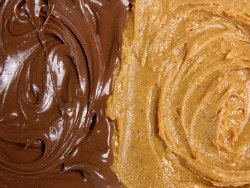 You can substitute any nut butter (almond works well) for the peanut butter if you’d like. Depending on your blender you may need to add a little more liquid. Enjoy! Place the ingredients into your high speed blender and blend for around 30-45 seconds or until your desired consistency is reached. Please leave a comment below if you try this delicious chocolate peanut butter banana smoothie. Happy Blending! I just tried a variation on this made with ingredients I had to hand. Peanut butter, frozen yoghurt (chocolate flavour and fat free), one banana, coconut milk and a shot of honey… My, oh my! Fantastic. Thanks for the inspiration. Awesome! Thanks for sharing. I love to see people take my recipes and tweak them with ingredients they have available. Frozen yohgurt…nice. After chemo I developed neuropathy in my feet and lower legs. I began a search for foods that would reduce the inflammation, I came up with a smoothie made with peanut butter, cinnamon, cocoa powder, honey, a banana, and milk. It is delicious. After a few months on this daily treat, the neuropathy is significantly minimized. I can finally fall asleep naturally without the pain. I am happy, and it tastes great! I have one every morning, it is my breakfast. No worries, I appreciate the honesty. You now know what kind of smoothies and possibly ingredients to avoid ;) Hope you find a recipe on my site that is pleasing to your palate. This was delicious! It was my first attempt of making a smoothie. I will try a new one tomorrow. Great to hear you found your first smoothie delicious, Deedra! Hopefully every smoothie from here on out is equally as delicious. Nice to hear you enjoyed this, Gabby. Isn’t it wonderful that healthy food can taste so good? Hi,I bought some bananas,natrel milk,I have cocoa powder at home,peanut butter,ground cinnamon,oatmeal,but no protein powder,maca,coconut oil,coconut shreds or flakes,or frozen fruit.can I still make this smoothie tomorrow without the other ingredients or should I wait until I have the rest of the ingredients to make this smoothie. Go right ahead and make this smoothie with the ingredients you have on hand, Kim.